Everyone loves pancake day and the classic creations that come with it, but with Flipping Good! you can make these annual treats a regular occurrence throughout the year. 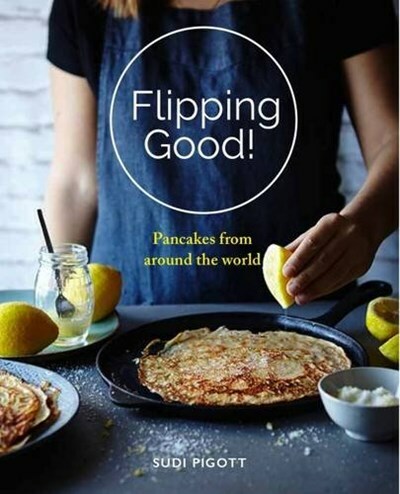 With chapters dedicated to Breakfast and Brunch, Main Meals, Snacks and Nibbles and Desserts and recipes taking influence from all over the world there's a pancake for every occasion. Sudi has taken influences from countries all over the world to create a dynamic and intriguing collection of recipes including: Ricotta pancakes with Banana and Honeycomb Orange Butter; Buttermilk and Spelt Pancake Stack with Poached Blackberries; Potato Latkes with Sumac Fried Egg; Galettes de Sarrasin with Leeks and Merguez sausage; Okonomiyaki with Shredded Cabbage, Prawns and Tamarind Sauce; Banh Xeo Rice Flour Pancakes with Prawns, Shitake and Mangetout; Russian Buckwheat Blini with Smoked Salmon; Fluffy Coconut Flour Pancakes with Apricots and Maple Syrup; Kaiserschmarren with Plum Compote.